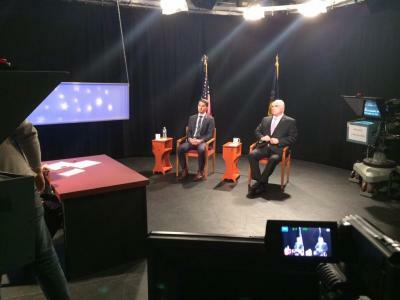 Thursday night's congressional debate between Republican incumbent Mike Kelly and Democratic challenger Dan LaVallee was, for many voters, the first time they've heard from the twenty-six year old political neophyte. A recent Mercyhurst University poll concluded that "nearly three out of four registered voters in PA-3 report that they do not recognize LaVallee's name compared to only 15 percent saying the same of Kelly." Thursday night was LaVallee's opportunity to change that. It doesn't mean everyone was watching. The truth is that few people probably were. But by capturing the news cycle leading up to election day with a strong performance in the debate, which was aired live on WQLN-TV, LaVallee would have given himself a much needed boost and the PA-3 a legitimate alternative to middling representation in Washington. LaVallee was at his best when he talked about constituents he met on the campaign trail who have benefitted from the Affordable Care Act and a few family oriented anecdotes also related to health care. He would have benefitted more from significant direct challenges to the Kelly congressional record. Kelly is a party-line guy, voting with the Republican caucus 95 percent of the time, even though his recent talking points have been about bipartisan relationships on Capitol Hill. Kelly repeatedly referenced bipartisan letters that he "co-authored" in Congress. That means that he, along with any number of other congressmen, affixed his signature to documents designed to make him look more centrist than his voting record would allow. LaVallee failed to point out that it is on Kelly's voting record, not his letter writing campaign, that he should be running for re-election. But even the incumbent avoided that paper trail. Instead of running on his record in Congress, Kelly's mantra in the last days of the campaign is that he should be re-elected because he's got Washington experience. He's an outsider turned insider and life on the inside must be good because the man doesn't want to leave. He seems to forget that the two-year term was designed to create turnover, not stasis. Moments of contention filled the sixty-minute debate. It seemed that the two men shared common disdain for one another. Kelly launched an ageist assault on LaVallee's youth and lack of professional - as well as political - experience. And LaVallee worked hard to remind viewers that Kelly has worked harder to forge the legislative dam in Congress than he has to break it. On more than one occasion it felt like I was watching a bully pick on the smart kid in the hallway in high school. I suspect that if Dan LaVallee had direct follow-up opportunities in addition to the 90-second responses to moderator Sean Lafferty's question, he could have worked Mike Kelly into a damnable rage. Both candidates tip-toed around real issues facing PA-3 with political platitudes that said little about the kind of action and guidance required to repair the district's economy and stabilize the intellectual exodus that has come to characterize regional "brain drain." When asked about representing the northern tier of the district, only LaVallee made direct reference to Mercyhurst, Gannon, and other local institutions that will play a role in the long-term success of Erie County. Such specificity when calling out Mike Kelly on his voting record would have been a boon to LaVallee's overall performance Thursday night. When Kelly answered the "Erie question" he replied that he'd lived here his entire life and played up his role as a businessman and community leader. He seemed to have missed the point, but then again he may not even have been listening to the question. Jim Wertz is a political junkie who thinks midterm elections are better than Christmas morning and the Easter Bunny. He can be reached at jWertz@ErieReader.com or @jim_wertz on Twitter.